Protesters have blocked thespians at Paris' Sorbonne University from staging an interpretation of an ancient Greek play that depicts white actors with darkened faces. The Sorbonne has vowed to restage "The Suppliants" in exactly the same format – and it has the government's backing. Greek theatre week is in full swing at the Sorbonne campus in Paris, just like every year since 1999. But unlike previous editions of the festival, this year anti-racism campaigners have taken offence to one particular play because several white actors were set to darken their faces to depict Egyptian characters. As actors were busy changing into their Greek costumes and applying various shades of make-up inside the Sorbonne's theatre on Monday 25 March, a crowd of around 30 students, supported by black rights activists, gathered outside. The demonstration became so heated that the Sorbonne decided to call off the performance, but not to cancel it. “I've had a lot of questions from colleagues and students asking for a new performance of the play, and I will try to do that,” says Alain Tallon, director of humanities at the Sorbonne. The Sorbonne has issued a communiqué condemning the demonstration and accusing the protestors of “complete incomprehension”. The Culture Minister, Frederique Vidal tweeted a joint statement with the Higher Education Minister, Franck Reister saying that the protest was “contrary to academic values and the principals of the French Republic”. Monday's showdown is the latest in a string of protests around Europe by rights activists to stop white people painting their faces black. Traditional festivals in France, The Netherlands and Sweden have been targeted by black rights activists, who say "blackfacing" is directly linked to the legacy of the transatlantic slave trade. Blackfacing is one of several traditions that make up the Dunkirk Carnival in the northern French port, where 44 ships transporting human cargo docked during the slave trade. The play in question, The Suppliants, by Aeschylus, is primarily a story about marriage rights in the times of ancient Greece, in which 50 high-born sisters flee forced marriage to their Egyptian cousins. 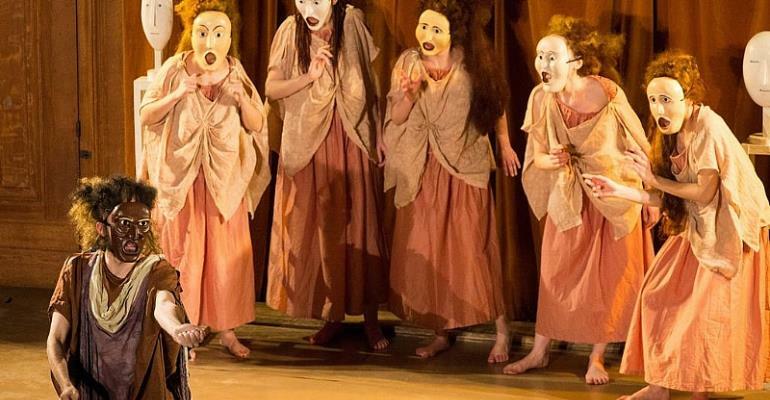 The director of the play, Philippe Brunet, has taken to Facebook to explain that skin colour in ancient Greece had different connotations to the idea of race that emerged during the transatlantic slave trade and its aftermath. “The difference is ethno-geographic rather than race,” Brunet says in a statement on Facebook. It is illegal to collect statistics on race in France, unlike many other countries in Europe. The ideal is that minorities will assimilate and become French – which has led to rights activists accusing the French government of whitewashing black identities. At the Sorbonne the pursuit of creative expression supersedes all, including racial identity. “We cannot accept this form of censorship, from people with no moral or intellectual authority,” says Tallon. There is little doubt that the Sorbonne remains an intellectual authority in the French-speaking world, but this week's confrontation has once again thrust the race debate to the fore in France.